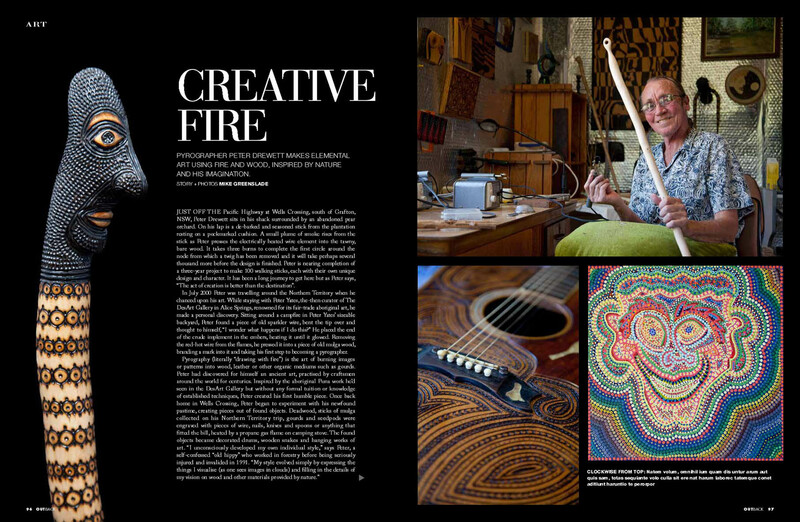 My story on Well’s Crossing artist & pyrographer, Peter Drewett has been published in this month’s “Outback Magazine“. I wrote a blog piece about Peter a few months ago and it’s good to see all the hard work come to fruition. The article is also great exposure for Peter and his fantastic 100 Walking Stick project. The project is now complete and Peter is looking exhibit his work, they make an impressive collection so if you know of a gallery that might be interested please get in touch. This entry was posted in Art, photography and tagged article, artist, Outback Magazine, Peter Drewett, photographer, photography, pyrography. Bookmark the permalink.